 A delicious oven-baked omelet, for brunch, lunch or dinner (photo courtesy Fruit & Veggies More Matters). 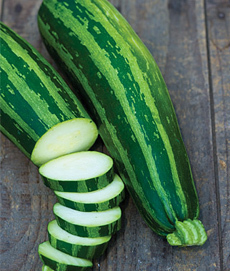 An heirloom variety, tiger zucchini. It tastes like supermarket zucchini, but is nicer to look at—especially raw, in crudités or salads. You can get the seeds from Burpee. Serve this omelet for brunch, lunch or dinner with a side salad. The recipe was sent to us by Fruit & Veggies More Matters, the consumer website of the Better Health Foundation. We made it last night, and look forward to a repeat appearance soon. You don’t have to be a skilled omelet-flipper: This omelet is baked in a pan in the oven. In our book, that’s a bonus. As an option, you can add a half cup of diced ham or sausage. 1. PREHEAT the oven to 375°F. Melt the butter in a large skillet over medium-high heat. Add the onion and zucchini; sauté for 5-7 minutes. 2. 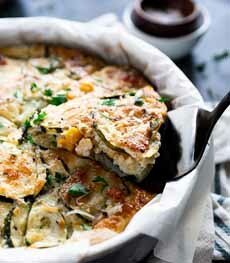 STIR in the corn and continue to cook until the zucchini is fully softened, around 2 minutes more‡. Remove from the heat and drain the excess liquid. Let cool. 3. WHISK the eggs in a large bowl, then then stir in the cheeses and seasonings. Gently fold the cooled vegetables into the egg and cheese mixture. 4. LINE an 8-inch pie pan with parchment paper and transfer the mixture to pan, arranging the top so the zucchini slices lay in single, flat layer. Cover with foil and bake for 25 minutes. 5. REMOVE the foil and bake for an additional 10 minutes until top is browned. Let stand for 10-15 minutes before cutting into wedges. *We like a larger portion for dinner, so we created a 6-egg omelet for two. †Save the corn liquid and drink it: It’s delicious. ‡We don’t like very soft zucchini, even in an omelet. Since the omelet will be baked for 10 minutes, we omitted this instruction.